I am quite pleased to announce that my book, "Bad Astronomy: Misconceptions and Misuses Revealed, from Astrology to the Moon Landing 'Hoax'" has been released by Wiley and Sons. After three years of long weekends, feverish midnight typing and not seeing my family except on my way to get more coffee, I have finally produced a book that goes with this website. BA:MMRAMH (since I get tired of typing the title pretty quickly) covers some topics you'll find here on the website, though with considerably more depth. For example, I researched the history of the egg-standing legend in the United States and was able to trace it to a simple misunderstanding of a magazine article published in 1945. Other chapters detail the Coriolis effect and the big Moon illusion, why the sky is blue and why we have seasons. 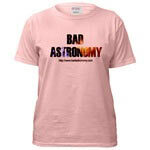 Besides new material on old Bad Astronomy, there is also quite a bit of new Bad Astronomy. There are chapters about UFOs, astrology and creationism, why you can't see stars during the day, and why small meteorites are cold when they hit the ground, not hot. The chapters are laid out in a logical flow, with some fun narrative in between. Let's put it this way: if you like my website, you'll like my book. I write the same way. The Wiley and Sons site has a web page up about the book. The page has some blurbage, as we say in the publishing business, which means good quotes from people in the field who rave about how great the book is. Besides that, the page includes: a PDF sample chapter (about egg standing) and the table of contents. Bob Berman, writer of the "Sky Lights" section of Discover magazine (!) wrote a very positive review of the book in the June 2002 issue. The Australian Skeptic Society devoted three pages to a very positive review of the book (warning: it's a PDF file, so you'll need a (free) copy of Adobe Acrobat reader). the same review in Norwegian! The National Science Teachers Association discovered they like the book too. Given that this organization boasts tens of thousands of science teachers across the country, I'm mighty pleased by this. The UK magazine New Scientist gives it a mostly favorable review. I got my first negative review! It's on a UFO mailing list, unsurprisingly. Read my page about it here (there's a link to the review from there). The book should be at discerning bookstores everywhere. If you're like me, and would rather have anonymous strangers handing you books at your doorstep, you can order the book from my website. That way you save some cash, and I still make an extra buck and my daughter gets that much closer to attending college. I love to hear from readers! If you have any comments about the book, mosey on over to the Bad Astronomy Bulletin Board and post them. You'll find a lively discussion of lots of Bad Astronomy there, and not just my book.